I am still trying to get this room cleaned up enough to take a picture. Oh, by "this room" I mean the room I am sitting in right now, my workshop. I really need your help figuring out colors but it's a total disaster in here! Between stuff I pulled out of the someday-mudroom and then haven't packed back in a box and the aftermath of the last two Christmas quilts, the new summer quilts for the kids, and the crochet project I started while I was sick... well, let's just say that disaster doesn't even really cover it. Plus now there's a desk in here from Baby Girl's room switch that is blocking up the works and it's just terrible. BUT, as soon as these last two quilts are done (So. Close.) I can really focus on fixing this room up. This whole halfway thing has GOT to go, if you know what I mean. I work from home in this very room every single day, so I really do *need* it to be nicer in here. ANYWAY. 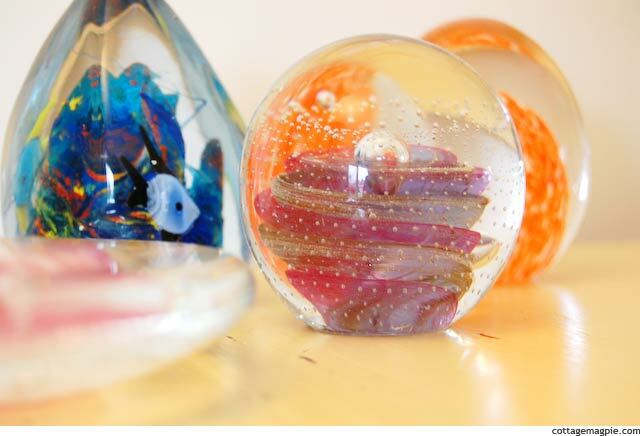 These paperweights are one of the things that I have in here that I don't have a spot for yet. I would love to put them in the windowsill so they'll sparkle in the sunlight, but that would put them at small child level, and I'm thinking that's not such a great idea. So another solution will have to present itself. But meanwhile I thought you'd like to see them. I don't have very many yet, but the ones I have I love. This pink one is the first one I bought. I thought it was so pretty and unusual being flat instead of round. In practice, it's a little hard to display or appreciate, but I love it anyway. When my kids are bigger and I can use it on my work table as an actual paperweight, it'll be great. Isn't the little fish cute? 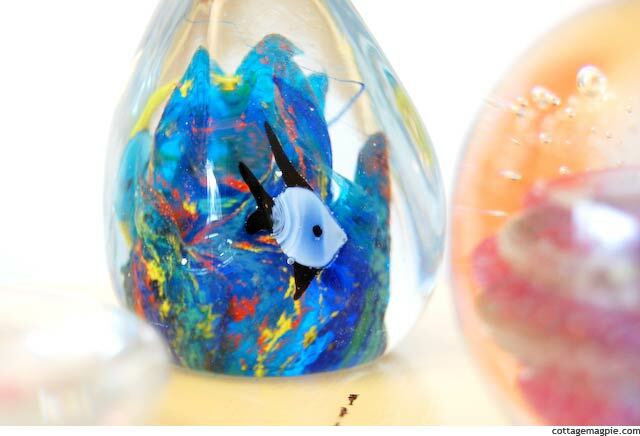 If you can believe it, this paperweight actually came from the Dollar Tree. Mr. Magpie bought it for me when we were first together. The pretty purple one I bought at the beach last summer. I love how it's so swirly and the bubble is trapped inside. It looks like a spell about to happen, doesn't it? I think this orange one is my favorite of all. I don't remember where it came from, and it's not precious, but it has the same kind of pattern in it as one that my Mom has that was her Dads. So this one reminds me of that. She used to keep it on this big old vintage desk that had been painted black and it would always be buried in her mess. Sometimes she would let me look at it when she was painting bills. For some reason, that desk was always a calm spot where I could talk to my Mom without drama, and that paperweight always reminds me of that. This little one is smaller and new, but it has the same orange dots inside, so it makes me happy. So, there you have it! 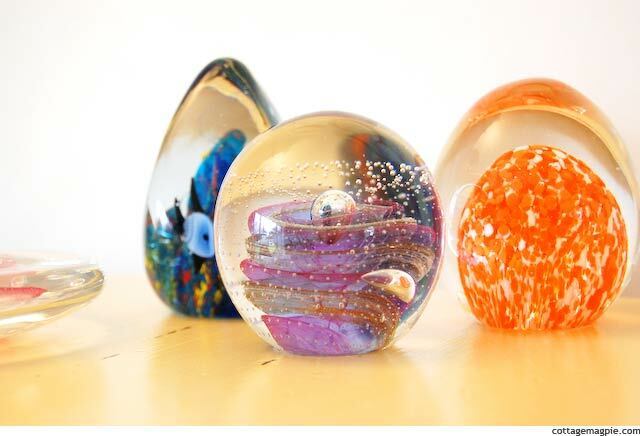 My very small collection of paperweights. I can't resist them. Do you like glass things? Okay, Angela. Out With it Already.